Only a being filled with altruism is capable of overcoming greed and hate to reach Buddhahood. According to Tantric thought, the highest absolute manifests itself in everyone and everything and the aim of every visualization, like the one the Mandala ritual depicts, is to discover this clear, luminous divine and to realize its glory and bliss within oneself. 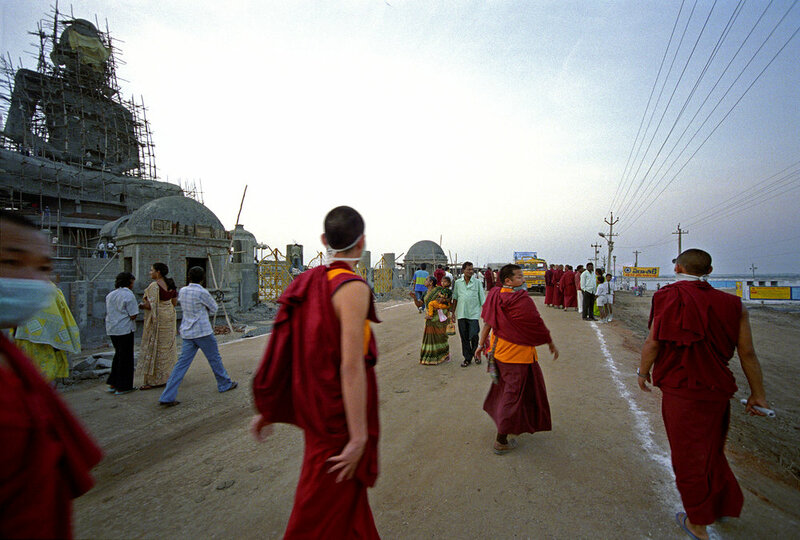 In January 2006, the Dalai Lama offered the Kalachakra Empowerment teachings in Amaravati, a small South Indian town, and also the very place where Buddha first revealed the Kalachakra teachings, according to the scriptures. 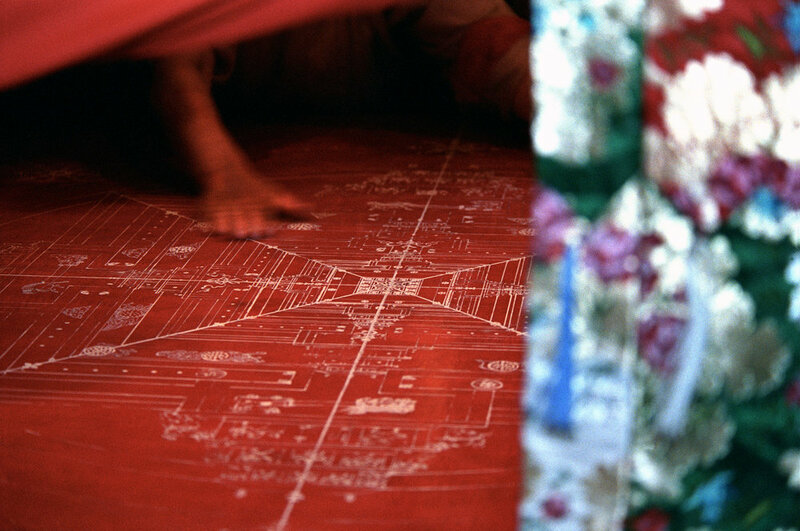 The Kalachakra is a Buddhist ritual in which a mandala is painted with colored sand made from precious stones. This mandala represents everything and is made for everyone. The ritual dismantling of the mandala in the final celebration and its pouring into the water stands symbolically for transitoriness of all material. For such an ancient teaching to be given again close to the site at which it originally occurred was a rare and auspicious occasion. It attracted Buddhists from all over the world. Many Tibetans took upon themselves a journey of three months by foot and public transports plus the very real danger of being punished for attending these holy teachings by the their spiritual leader. Any activity associated with the Dalai Lama is still strictly forbidden for Tibetans by the Chinese authorities. I hold the little plastic cup of steaming tea, very sweet and strong, in my hands. It is eight o’clock on a January morning; the mist that fell during the night is fading away. It is going to be hot today – just like every other day. I am sitting at one of the busiest streets in Amaravati about 100 meters away from the Teaching tent that holds the temple where the Dalai Lama gives the Kalachakra empowerment. Throngs of passers-by stride towards the Teaching ground, their many feet kicking up clouds of dust. Right now it looks like a purple stream for they are mostly Tibetan monks in their traditional robes. Even from outside I can hear the Dalai Lama’s voice amplified through the loudspeakers placed on every street corner. Foreigners can tune in with their radios and listen to the translations in many different languages. Since my arrival a week ago, the number of pilgrims must have tripled to around 100,000. Festively dressed Tibetans, monks, nuns, from all over Asia, Westerners and local Indians all wait to be checked by the police. Everybody is in motion and not even the long queues that build up in front of the gates to the teaching site can diminish the excitement in the air. Nearby, hundreds of beggars sit in the dust and wait in line for some change, knowing well a Buddhist’s duty is to give to the poor. Above this whole scene, in majestic silence the giant, 30 feet high Dhayana Buddha statue looks on. It is still wrapped in its filigree scaffolding. I head off to photograph the Monlam kitchen, two open-air kitchens where about two hundred people busily prepare tea and bread served during the teachings to the attending pilgrims. Arriving, I see teenage monks gathered around three huge metal cauldrons (around the size of three bathtubs), which boil away on open wood fires. The young monks talk and laugh, some sit reading newspapers. If it wasn’t for the silver teapots they all have with them this could look like any group of young adolescents. The cooks busily prepare the tea, stirring and testing it, adding a bit more butter or salt, others add some wood to the fire. 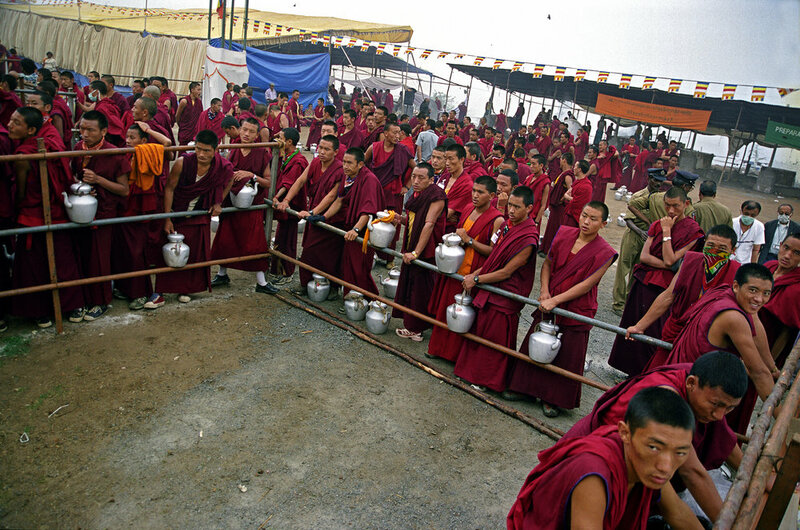 As in Tibetan tradition, lay-people come to offer butter, milk and tea. The monks wash their teapots and line up next to the cauldrons, scrapping a little amongst themselves. It feels like just before a race. The filling of the teapots is the start shot; and then they’re off, sprinting with their hot pots towards the teaching site entrance. They spread across the ground like a silent wave, fanning out through the corridors, running with bent upper bodies, careful not to disrupt the ongoing teaching. Again and again the monks have to fetch more tea to fill the thousands of cups. Towards noon the heat under the tent is only tolerable due to a little breeze coming from the nearby Krishna River all the monks still sit and listen. I meet Kate Saunders from the organization International Campaign for Tibet. We go to the New Arrivals Camp. Fires burn with sizzling pots and pans, children scamper around, women replait their braids, 108 in total, held together at the bottom with a ring or jewelry. It is very apparent how quickly they have made themselves at home: no surprise since the most of them are nomads in their hearts. I am not allowed to take any photos. Most of these Tibetan pilgrims will return to Tibet and they could face prosecution if their local authorities recognize them from any published picture. Even the Dalai Lama advises these people to deny their allegiance towards him if necessary. "My image is in your heart" he assures them. I have been told of Tibetans who hang up empty picture frames instead, knowing well what should be inside. It is late. I have to leave the camp for a conference at the Press Centre. As always, I am stopped by many curious locals, politely asking questions. They want to know all about the Dalai Lama, about Buddhism, about me. As ever their tolerance and interest amazes and humbles me. Within the community of this little town there are Hindus, Christians, Buddhists and Muslims and each religion has their place of worship. They adapt to these masses of strangers with very inventive offers. I just saw a young man ironing clothes on a very busy street. I am trying to interview one of the official spokesmen of the Kalachakra, Jador Rinpoche. He is the ex-abbot of the Namgyal Monastery, the Dalai Lama’s own monastery, which was once contained within the walls of the Potala palace and has been refounded in northern India. I am lucky he can spare ten minutes for me in his extremely busy day. Jador Rinpoche is very serious but mild and respectful, with a very vivid and attentive face. His gaze makes me feel X-rayed or at least instantly analyzed - a puzzling thought. Many people I interviewed agreed that the Kalachakra teachings are very complex texts, only understandable for highly accomplished scholars. I am most curious in the different ways a scholar or a layperson might experience this event. He believes that the teachings themselves give a marvelous range of advice. Moreover the blessing part is for everybody. They will go home stronger than they came. They will continue what they have done here: reciting mantras and prayers. But Buddhism is more that praying and wishing. It is taking one's own responsibility in one's own hands. 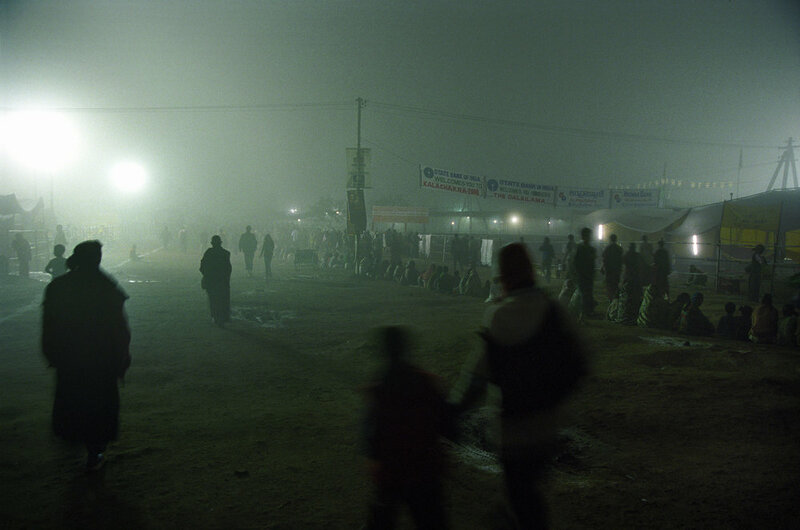 I turn his words in my head as I make my way to the live Tibetan concert, one of the many other social events held. As I pass the site of the old Stupa. I see the thousands of pilgrims peacefully flow around the sacred site, lit with a reddish glow from the little flames of the butter lamps. Above, thousands of tiny prayer flags sway in the breeze of the night sky.